Modeling a business requirement is more efficient with an object model. Workflow engines and BPMN 2.0 are powerful extensions to object-oriented business apps. During the past few years, I've seen many projects where nearly any kind of business requirement was modeled into the technical object model, independent of the reason for the requirement. In many cases, modeling business requirements into a technical object model is quite OK, and I agree with it in general. However, modeling business requirements into the affected business objects can also lead to an ugly and complicated data structure. Let's look into a short example to illustrate my thoughts. Our web developers can easily check the new flag isOrdered to decide whether the color selector is still available in the GUI. What we have done so far is add a new business behavior into our technical object model by changing the database schema. Is that a wise strategy? 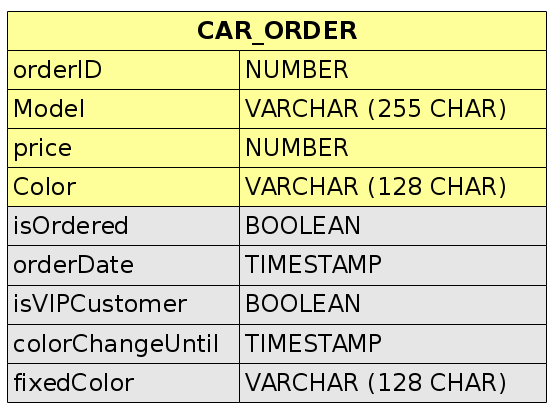 Now we have modeled the different business states into a new business process model called Car order. The information about whether the car has been ordered has moved into a BPMN 2.0 business process model. A workflow engine can read such a model and synchronize a new process instance with this model. So, when we now link our technical object model with the business process, we can still go on with our initial first object model version Table 1. Our web developers can simply ask the process state against the workflow engine to decide whether the color selector should be available. A workflow engine manages not only the process flow but also all information about the process, such as the creation and order date and all the actors involved in the process. Let's go further increasing the complexity. One day, our marketing team brings up another new idea: VIP customers! We have added a new flag indicating VIP customers and also additional data about the possibility to change the color. 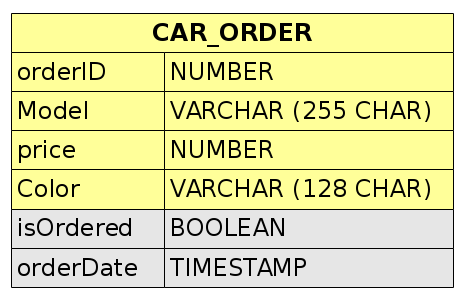 Our CAR_ORDER table now looks not very trustable, even if we split it up into different tables. We can't that this was the last idea of our marketing team. But what would be the solution in case we use a workflow engine? The strategy looks very different. This alternative process model defines now a new state Pre-Ordered. This task contains a timer event which monitors the order date and automatically updates the state of the order based on time period defined by the model. Again, we do not need to change the technical object model here! We simply assign new orders for VIP customers with a different process model. Also, our web development team has no need to change anything. Still, the color selection is hidden if the status Ordered is reached. This all is defined by our new process model and can be controlled by the workflow engine. What we have done here is simply move the task Ordered into a separate lane. A lane in a BPMN 2.0 model defines a specific actor in a business process. By moving a task into a lane, the task is assigned with a different actor — in our case, the production team. Human-centric workflow engines like Imixs-Workflow are specialized in modeling such user-centric behavior. Each task can be assigned to different persons, groups, or roles. The access level can be modeled in a fine-grained way by assigning the read and write access to different actors. So, what we do here is simply change the write access of the Ordered task to our production team. This means that only the production team is allowed to modify the process instance during the task Ordered'. With this new process model, members of the production team will see the color selector and will be allowed to change the data even if the car is already ordered — but the family members may only see a message to ask the sales agent if a further change of color is possible. Note that we still did not make any change to our original data model, but through the use of a workflow engine, we solved three very different requirements with three separate process models! What I wanted to show you here is that modeling a business requirement in a business process can be much more efficient as in the object model. With the help of a workflow engine, you can change the behavior of an application without changing your technical data model. At the present time, where Agile projects have become self-evident, a software system should provide the ability to implement changing requirements independent of the technical object model. Workflow engines and BPMN 2.0 are a powerful extension to object-oriented business applications.